I love egg casseroles that you make the night before, refrigerate and bake the next morning. This casserole recipe was given to me by my friend Victoria. I have changed it a little bit. The original recipe calls for 1 pound sausage browned, I use Jimmy Dean Hearty Sausage Crumbles. This is amazing it comes fully cooked, you just pour it out of the bag, no browning the sausage...I hate to brown sausage! I also changed slices of bread to using Vienna Bread. I get a loaf and slice it myself. In this casserole I also did not toast my bread and the bake was a little more wet than in the past when I toasted it. Nothing like the smell of breakfast baking in the kitchen on a weekend morning. This dish is not pretty but it sure taste good. Comfort food at its best. Just the right blend of onion, green pepper and Italian seasoning. I like to serve with a warm loaf of bread. I bake up a loaf of bread from the dairy section, just unroll and bake, it taste just like homemade. Brown ground beef and drain. Chop onion and green pepper. In large pan add all ingredients. Cook on medium low heat for 45 minutes or until macaroni is tender. Serve with Parmesan cheese if desired. I made these Belgian Waffles for Cally on Saturday morning before her All County Golf Tournament. We had waffles, bacon and eggs. This was the first time I had made these waffles and they were delicious. I said they were the best waffles I ever had but Bill disagreed. Cally shot an 83 and placed 2nd for the tournament. She made 1st team All County. We are proud of her accomplishments for her Senior year! 1. In a large bowl, combine flour, sugar, and baking powder. 2. In another bowl, beat egg whites until stiff peaks form. 3. In yet another bowl, lightly beat egg yolks and then add milk, butter, and vanilla, mixing well. Stir into dry ingredients just until moistened. Fold egg whites into batter. 4. Bake in a pre-heated waffle iron according to manufacturer's instructions, until golden brown. 5. Serve warm with fresh fruit, jam, or syrup. I made these cookies earlier in the golf season. They did not disappear as fast as the other cookies I had made. They were good but seemed a little tough with the cereal in them. Preheat oven to 350 degrees F. In a stand or electric mixer beat the butter and sugars until light and fluffy. Slowly beat in the eggs and vanilla until well combined. In a large bowl combine the flour, Cinnamon Toast Crunch Cereal, oatmeal, baking powder and salt. Slowly add to wet ingredients along with the white chips until just combined. With a cookie scoop, scoop dough and place onto parchment lined baking sheet 2 inches apart. Bake for 9-12 minutes or until edges just start to turn golden brown. Let cool for 5 minutes on baking sheet then transfer to a cooling rack to finish cooling. These are the sheet cakes that Cally made for the Firehouse chicken dinner. Cally is a cadet at the firehouse. The peanut butter cake is the favorite of the 2 cakes at the firehouse. Combine margarine and milk in a saucepan. Bring to a boil. Remove from heat and add powdered sugar and almond extract. Beat well with a mixer. Spread over warm cake. Stir well and pour into greased or parchment lined cookie sheet pan (jellyroll pan). Bake for 15 minutes at 375 degrees. 3 1/2 cups powdered sugar and 1 Tbsp vanilla. We were at a wedding reception a few weeks ago talking with some friends and they asked if we had ever had grilled pineapple. Bill and I both probably gave them puzzled looks as we had never heard of it before. So they told us how to grill it and we had it for lunch today. Oh was it ever easy to do and really good. The smell of pineapple grilling was amazing. I am not a pineapple fan but this was good. It was warm,tender and juicy. Next time you are grilling out give it a try, I don't think you will be disappointed. source: Clark and Jennifer S.
Cut pineapple in wedges lengthwise. Sprinkle with cinnamon. Place on grill until warm and it looks a little grilled. If you have a grill with big openings in your grate you might want to get a grilling sheet that has small holes in it and you just place it on your grate and put your pineapple on top. Fall is in the air. I love this time of year. Cool weather, football games, homecoming and Halloween, oh what fun. I made these pumpkin bars for the golf match tonight and they were a crowd pleas er. They were like pumpkin bread with icing on top. Super moist and just the right sweetness. The only thing I would do different next time is maybe add some pumpkin pie spice. I especially like them because they make a whole cookie sheet full. These would be good for a bonfire or potluck. Mix all ingredients together with whisk and pour over bars smoothing out with a spatula. This sugar cookie bar is out of this world delicious. I have made these to take to church and everyone loves them. They even look like I put a lot of trouble into them and that is far from the truth these are super easy and make enough for a crowd. I will be making these for the Golf Team's pizza party on Tuesday night. These cookies come from the blog The Girl Who Ate Everything Christy received this recipe from a reader and she also gives these cookie bars an awesome review. Christy did change her icing on half of her bars to an almond icing. I used vanilla in mine. Thanks Christy (The Girl Who Ate Everything) and Monica (Lick The Bowl Good) for inspiring me to do this blog. I am sure if you head on over to their blogs you will fall in love with them too and maybe you will decide to start blogging. For frosting combine butter and cream cheese until smooth and creamy. Add vanilla and salt. Add powdered sugar in 1-2 cup increments until combined, then add milk a little at a time and mix until smooth and spreading consistency. You may not need all the milk! Spread over cooled cookie bars. Our County Fair has a best cookie in the county competition each year. As soon as the fair books come out Cally and I hurry and get our entries sent in as there are only 25 entries accepted. Can you imagine being a judge and having to select 1 cookie out of 25 for best cookie in the county? Well they select 5 cookies actually 1st place thru 5th place. This cookie has lots of yummy ingredients....White Chocolate, toffee bits and pecans...mmmm....they are melt in your mouth good. Cally had a golf match tonight so I needed to put something in the crock pot. That was easy, it has been cold here in Ohio the last couple of days so I thought Chili sounded good. After riding around the golf course in a golf cart tonight with 2 coats on and a blanket on my lap the Chili sure did taste good! And even better her team won their match...yay!!! I made my chili and put it in the crock pot on low for 3 hours and it was hot and ready to eat when we got home. The corn bread was made this morning and then I just warmed it up when we were ready to eat. This corn bread is so sweet it taste like cake. It is best right out of the oven lathered up with butter..........mmmmmmmmmmm..........but reheating in the microwave and then buttering was good too. Brown hamburger, drain. In a dutch oven add all ingredients and cook on low for about 45 minutes. Serve with crackers and shredded cheddar cheese if desired. These are the best peanut butter cookies I have ever had. They come from the blog Lick the bowl good, Monica has a heart warming story about the origin of these cookies. Her title for these cookies is Welfare Peanut Butter Cookies. You can click her blog title above and head on over to her blog to read her story about these cookies. Thanks Monica for sharing this wonderful cookie recipe! The only thing I did a little different is I dip my fork in sugar before I flatten them. This puts a sugar coating on the top of the cookie...yummy! Mix fat and peanut butter, add both kinds of sugars and mix well. Add eggs and beat well. Drop dough from a teaspoon onto baking pan. Flatten with a fork dipped into sugar. This cake is good anytime of the year but on a hot summer day this cake is fabulous. When cut the inside of the cake is a beautiful orange color and really moist. The outside has a citrus glaze over it...mmmm powder sugar and lemon juice, nice and tart to go along with the sweet cake. I have also tried other flavors with this cake such as cherry chip cake mix with cherry jello, Lemon cake mix with lemon jello and my second favorite behind the orange is a white cake mix with lime jello and then glaze the cake with powder sugar and lime juice. Mix up this super easy cake and enjoy! Glaze: 4 T lemon juice and enough powder sugar to soupy consistency. Pour over cake. Since the golf season is underway I have been busy making cookies for the golf team's golf matches. My daughter's high school does not have a Girls Golf Team so she plays on the Boys Golf Team. The only bad thing about this is she has to play the boys rules and from the Men's tees. She is doing a fantastic job this senior year. She is on the Varsity team playing 5th man. She has had some interest from a few Colleges so far wanting to see about her playing for their Girls College Golf teams...We are proud of her! Well on to these Terrific cookies. These cookies are orginally a sugar cookie from the blog Savory Sweet Life. 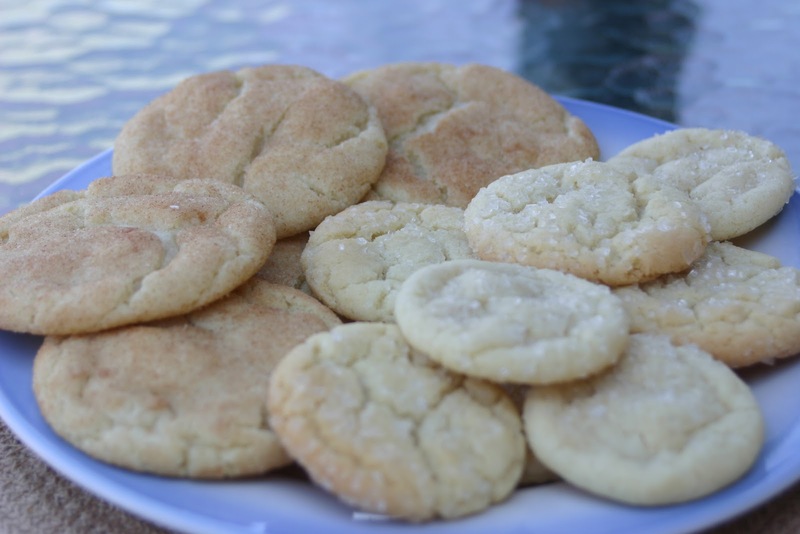 I made them at Christmas and decided they would taste good as a snickerdoodle cookie. So this is a double treat, I bake the teams cookies on Saturday for all the mathes that week and then place them in the freezer until the day of the match. This recipe is nice because I just double the recipe and make them both ways for 2 different cookies. The only thing different between the 2 is the sugar cookies get rolled in sugar and the snickerdoodles get rolled in cinnamon sugar. Preheat oven to 350 degrees. Cream together butter and sugar until creamy. Mix in 1 egg yolk at a time and then add the vanilla. Add flour, baking soda, cream of tarter and salt. Be sure to scrape down the bowl. form into balls and roll in either sugar for the sugar cookies or the cinnamon sugar mixture for the snickerdoodles. Place balls on cookie sheets lines with parchment paper. Bake for 12-14 minutes. Remove from oven and cool on cookie sheets for 5 minutes before transferring to cooling racks.